Google's new Artificial Intelligence "RankBrain" is Now Part of the general Search Algorithm helping to improve the results for previous unseen queries. Published: Oct 28, 2015. 14:55 +0100. In a scoop by Bloomberg Business during an interview with Greg Corrado, Senior Research Scientist with Google, it was revealed that Google has been using an Artificial Intelligence known as “RankBrain” to improve search results for the last few months. The system known as RankBrain has been helping to interpret some of the many millions of user searches carried out each day to improve the relevancy of some of the more complicated \ unusual queries. What follows is a comprehensive guide to the new AI-based algorithm including what it is, how influential it is in the search results, and whether you need to adapt your SEO strategy in light of the new information. It is the name Google has given to its new artificial intelligence system that uses machine learning to improve the search results for unusual \ difficult words or phrases. By machine learning, it is meant that the AI teaches itself rather than following human created directions or programming. More simplistically, if it sees a word or phrase it doesn’t know it can make a guess as to what words or phrases have a similar meaning and provide search results accordingly. As a consequence, it has significantly improved Google’s ability to return accurate results for never-before-seen search queries. Is it Learning on the Fly? No. According to Gary Illyes and then expanded on by the Bloomberg reporter who broke the story it is not adapting on the fly. Instead, it is periodically retrained and then rolled out into the Core Algorithm. @glenngabe it's not. The team was working on it for months and its effects are expectable, not assumable. @methode @glenngabe yeah. It's periodically re-trained, but it's not learning on-the-fly. We’ll keep experimenting with and testing new models, and we’ll make updates as we come up with models that do a better job than the existing one. That could be about refreshing the data or developing new neural net architectures. In essence, it will be treated a little like how they roll out Penguin or Panda. According to Bloomberg, it uses AI to embed the written language into mathematical entities called “vectors” that can then be understood by computers. This allows the AI to make guesses at which words might have a similar meaning. @ollieglass @ejlbell it's converting words and phrases into vectors. Closely related to Hinton's work on thought vectors. We were surprised by the extent of the improvement obtained by reversing the words in the source sentences. We were also surprised by the ability of the LSTM to translate very long sentences correctly. We were initially convinced that the LSTM would fail on long sentences due to its limited memory, and other researchers reported poor performance on long sentences with a model similar to ours. And yet, LSTMs trained on the reversed data set had little difficulty translating long sentences. So while we can’t be 100 percent certain exactly how RankBrain works, the information does give some interesting insight as to where Google is heading with machine learning and the search results. Of course, for more information about what Google is up to more generally regarding AI and Machine learning their public research area on the topic is well worth a look. How Influential is it in the Search Results? According to the Bloomberg, RankBrain is now the third most significant signal in the Google Algorithm, although we are not sure there is sufficient information for this claim at present. This is significant considering there are hundreds of different ranking factors. What’s the title of the consumer at the highest evel of a food chain. © Screenshot. Because of RankBrain Google was able to connect the long query to a much shorter and more relevant one, increasing the accuracy and relevance of the result. We suspect as it continues to develop it will become increasingly more adept at doing so. From the excitement and enthusiasm shown by Google for this, it is clear that it is having a significant impact. Greg Corrado described it “as having gone better than we would have expected “. Do You Need to Revise Your SEO Strategy? This very question was put to John Mueller, webmaster trends analyst at Google, who clearly stated that nothing particular was required to optimize your website for the new AI algorithm. @StelinSEO You don't have to do anything specific for RankBrain. However, if we were to consider how it all works (i.e. 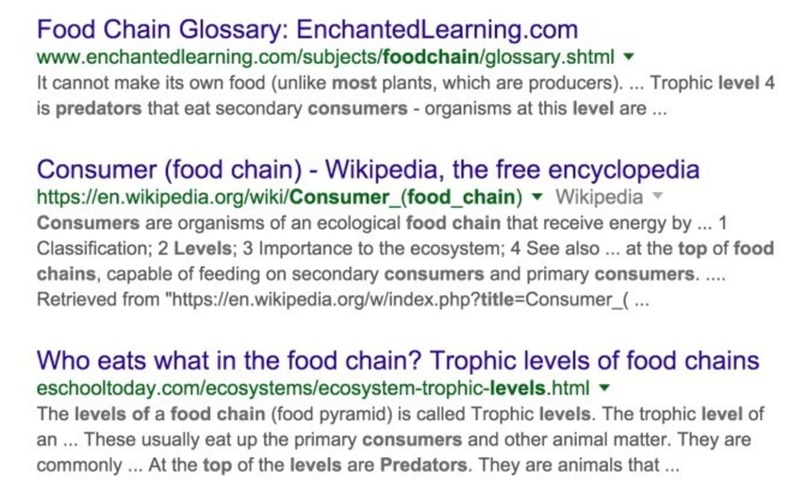 Google takes a previously unseen query and relates it to something shorter \ more relevant and returns the results for that query instead) then it is clear that having high-quality content is going to help. Of course, this has always been the case, and John Mueller’s response makes sense there is nothing particular you need to do.